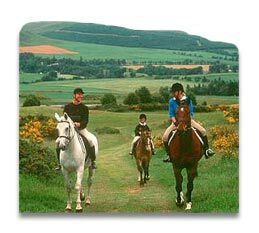 Horse riding and equestrian facilities in the Scottish County of Perthshire. Located in central Scotland Perth and Perthshire are Scotlands ancient capitals and have a rich history. The famous Gleneagles Equestrian Centre is only 4 miles from the city of Perth and offers riding lessons in its well equipped equestrian facility. Gleneagles is hard to beat for horse riding holidays in Scotland. Experts and beginners alike find the horses, tuition and indoor arena faultless. You can also enjoy trail riding & trekking with the many specialist riding centres who organise Horse Riding in Perthshire. Trek into the foothills of the Ochils where the scenery is truly outstanding, the air is fresh and the wind in your air makes you feel one with your horse. Book a trail ride with Perth trail-riders and enjoy the panoramic views to the north and west over the Perthshire Highlands; then south to the rolling landscapes of Fife and east along the fruit fields of the Carse of Gowrie and over the River Tay. As well as excellent horse riding and equestrian facilities in rural Perthshire, you can enjoy a wonderful walk along Tay Street crossing Perth Bridge and viewing the ever changing River Tay. Near the summit of Kinnoull Hill is Kinnoull Tower built by the ninth Earl of Kinnoull in the eighteenth century and offering stunning 360 degree views of this wonderful part of Scotland. Check our livery yard facilities guide for information on what you should look for in a good livery yard. Most Perthshire livery yards will offer a range of facilities based on the price you pay. Some will offer individual stables and some the popular American barn type stables. Livery or stable yard customers will usually have the use of a menage included. Horse livery focused yards will normally include the use of show jumps and cross country jumps, with facilities such as rug wash, horse wash, solariums and lessons included at an extra cost. Local Perth Riding Schools offer riding lessons and equestrian instruction, with licensed instructors offering riding lessons at all levels. Freelance equestrian instructors can offer individual or specialist riding tuition. Easterton Equestrian Stud offers livery, home bred horses for sale and courses on lunging and equestrian vaulting or gymnastics on horseback. The Highland Pony Society is a not-for-profit Charity associated to the National Pony Society, which enables all the native breeds of the UK to speak with one voice. The Society looks after both the Highland pony and the society member. Her Majesty the Queen has a large working stud of Highland ponies. The Trekking & Riding Society for Scotland. The Governing Body for Recreational Riding in Scotland is dedicated to setting and maintaining the highest standards in recreational riding. The society is a founder and Executive Member of the Scottish Equestrian Association (SEA), the umbrella body for all equestrian activities in Scotland. The Mains of Taymouth stables, trekking and learning centre is situated in the heart of Scotland with some of the most spectacular views and scenery. Our trekking alone can offer breath taking panoramic views. Our professional and enthusiastic staff are here to make sure you get all you want from your riding experiences at Mains of Taymouth stables.